We also have this piece that @wanda-seldon wrote on LEDs. That thread might also be a golden opportunity to ask questions if you have them. I agree it's a dilemma. I myself pondered on deleting my own account. But I decided to clean it instead, leaving any community content. I too think it's a loss if the contents are just gone like smoke. But there is no way we can know all reasons why someone wants to delete their content, and this wish should always be honoured. I think maybe a compromise is to allow users to give away topics for adoption, or just leave from a deleted user. But this should "always* be with consent. I've had users, on Tildes too, create scenarios over the weirdest stuff where I'm uncertain if I am ok with leaving stuff up. If deletion is not an option, I am certainly unwilling to do community stuff that often can attract some negative attention among the positive. Eh, sorta correct. I know I'm not the only o r who did a bit of housecleaning when it was announced Tildes was going public. Which did not involve deleting the account. Kat, it was honestly no problem. You've had enough hardships in life, you deserve a break. I obviously hope you pull trough, and get to do the one year survey too. But if not, then I will take care of it with great delay. Also while I am at it, a big thank you to @Kat for making the original and half year survey. Without her starting this, we'd have nothing. Due to @Kat’s ever-failing health, I will be analyzing the data instead of her this time around. If you have no idea what this is about, see the demographic survey that was posted on the day of Tildes’ half-year birthday. She’s done this before, so let’s see what's new. The original survey was answered by 404 people, while the half year survey was answered by 293. Though the total number of replies was lower, the completion rate was actually higher: 293 responses from 422 unique visitors, or 69.4%, up from the first year’s 404/599=67.4%. The decrease in answers is most likely attributed to the change of the default sort from “Activity, all time” to “Activity, 3 days”: the response rate held fairly consistent for the first three days, then plummeted after the third as the topic stopped being able to gain any publicity. Though response rates on the original were not high after the first three days, there was a steady trickle up until the survey stopped accepting responses. While the numbers are relatively big (for a community of this size), do take anything found with a healthy dose of scepticism. Even though the original dataset she shared with me does not contain any identifiable information (all I can see are randomly-generated user strings) the specifics of that data will not be posted, as was mentioned during the original survey. This is because I am unable to be certain I can sufficiently anonymize it. Typeform has created a summary of the data on a per-question basis with substantially more datapoints than this thread, which you can find https://themeerkat.typeform.com/report/H2TtYg/rVf75AqbKaPncy6y. I will compare the statistics with a similarish reference set based on the six most common territories, all of which are above one percentage of the survey answers. That means when I compare on the general populace, I will base it on numbers from USA, Canada, UK, Australia, the Netherlands, and France. I’ll clean up my data sheet and post it in the comments later. You all are absolutely encouraged to fix it because it will most likely contain errors. What has changed in the first half year? This time around an age range was used instead of an exact numerical input, but if we were to assume that everyone is aged in the middle of their age range (so 20 for 18-22 year olds, for instance), the average age of a user would be 26.84 years, or 26 years, 9 months, and 4 days old (roughly). So we’ve grown a bit younger than last year, on average. Gender distribution seems to be roughly the same. We see a small decrease in percentage of heterosexuals, divided roughly evenly on the remaining categories. We also see a significant increase in the amount of transgender users, but since the amount reported is small, that could also just be statistical noise. The percentage of polyamorous people has remained exactly the same. For pronouns, there are only three users who prefer it/its, and zero who prefer any neopronoun set: every “Other” was offering commentary on the question rather than answering it. Similarly, almost all of the “Others” for orientation were expressing that they didn’t understand the specifics of the options given. All in all, little has changed. In both surveys, three options dominated: the USA, the UK, and Canada. On that end, little has changed, though it seems that all of the Swedes disappeared, with zero answering the half year survey as compared to eight for the first one. Wonder what they’ve been busy with. Unsurprisingly, about everyone speaks English. What is more surprising is the lack of native multilinguals: fewer than 6% of Americans who natively speak English also natively speak a second language. For comparison, that’s 10% for Australians, 21% for Canadians, and 13% for the UK. This represents an overall decrease in geographic diversity, with users coming from 36 different countries as compared to 42 the first time. Compared to the world at-large, we sure are a god-denying folk. A whopping 52% of us consider ourselves atheists, whereas the sample data puts it at 12.1%, so we’re far from the norm of our fellow citizens. We got a few interesting answers in the “other” section of the religion part of the survey. We got a few interesting ones I had never heard of before, like “Discordian”. But generally speaking, around half of them were either “none” or one of the actual options. Two stood out to me though. To the one Chinese user who filled it in as “The heck is chinese traditional”: I have no idea either. To the one Australian user who wrote “Left-hand path Heathen”, you be yourself, mate. The average has barely moved in the last half year—we’re still slanted very much to the left. Unlike the first survey, there was no freeform input this time around, so the specifics are hard to discuss. We have seen a drastic fall in the percentage of Windows users. It was at 60%, and is down to 43%. Nearly all of this has gone to Linux, which is now at 38%. That’s quite large, especially compared to the reference data, which has Linux use among web users at 1.23%. It’s like a herd of penguins in here. Compared to half a year ago, not many of us have switched mobile OS. Compared to the calculated data, we like Android slightly more than average. 62% vs 72%. Not much interesting in the “other” section, though I will give a salute to the one American user still holding out on Windows 10 Mobile. We have a pretty even distribution with three exceptions. “Computer software”, “Never employed”, and “IT”. Nearly 3/4 who answered “Never employed” are currently students. Among the students, we only have one student that proudly smokes and has no interest in quitting. The campaigns seem to be working. If we look at the users who visit Tildes multiple times per day, we see a few interesting trends. Nearly all of them use Android, and nearly all of them are employed. Beyond that it all seems surprisingly… average. Overall, people rated Tildes as a platform as-it-stands a 5.7/7 (0.81), and their optimism for the future of the site at a 5.4/7 (0.77). The most important reason they use the site (of the options given) is “Minimal, fast design” at a 4.6/5 (0.92), with “Privacy-consciousness and lack of trackers” right on its heels. 20.8% of users have ever contributed money to Tildes (surprisingly high, compared to most donation campaigns), with about half as many making a recurring donation. Despite @Kat’s insidious attempt to influence the data, “waves” as a demonym only received 5.5% of the vote. The leader for that, overwhelmingly, is “no demonym at all”, with a combined 49% of the votes and 18.5% of respondents strongly preferring the site not to have a demonym. Second place, the generic “users”, only has 15.8% in comparison. The first Tildes-specific demonym present is Tilders/~​rs, with 13.4%. Most notably, about ⅔ of users would prefer Tildes to be remain invite-only long-term. The survey had three freeform questions: “What do you like most about Tildes, thus far?”, “What do you like least about Tildes, thus far?”, and “What is the most pressing missing feature/‘pain point’ for you about Tildes in its current state?” All the comments fill over 30 pages, so it seems like we really have a lot to say. You can download and look at all of the raw answers here, if you’d like. They’ve been shuffled to ensure privacy. A large majority of the comments boil down to “a quality of discussion where disagreement is discussed in a respectful and level-headed way”. A very significant amount also point out the lack of “low effort content and trolls” as a good thing. A significant amount also mention the simple and quick-loading interface. We also have one user who believes he can find a twerk team on Tildes. So on this, @Deimos can feel proud for what he has done. Though you know what really makes the site good? There is one comment that properly gets it: “The people, d’awwww.”. Yes, that includes you. But not everything is perfect, though negatives about Tildes seem to be a lot less unanimous than the positives. There are a few that repeat a bit more often than others: the biggest one is “left centrism in discussions” or “echo chambers”, though in a close second, as with any political discussion, is its exact opposite with complaints about “too much discussion about left-centrism in discussions”—notably, though, in the question “Do you feel as though Tildes has a good mix of political opinions, for your personal preferences?”, the leading answer was “Yes” with 63%. A small amount of users also think we have too many software developers. Beyond that, the main complaint that stands out is “lack of users and content”, which I am sure will improve in time. This too is very varied. A lot of the comments are actually about features that have been introduced since the survey was done, like bookmarking. Honestly, it’s not that many complaints compared to just likes and dislikes. The “majority” seem to be on a lack of tag autocompletion, USA-centrism, and the lack of a mobile app. There was one more section: “If you would like to offer any long-form commentary, criticism, or feedback regarding Tildes, you may do so here.” Due to its nature, I’ll let you read through them yourself in the raw data, if you’re interested. First of all, to everyone who took the time to answer: thank you! I hope this post and the survey has brought some fun to everyone. If there’s an interest, I am sure that Kat, myself, or someone else will make another one at the one year anniversary. We already got some feedback in the previous thread, but we’re always open for more. I will do some additional data comparisons on request. I might be a bit occupied this weekend, though, so that will come when it comes. Pretty much. You could have a system with an extreme that is smaller than the universe. So it doesn't necessarily have to be at the end of all. But it is in quite extreme conditions the terms start to be wrong. I do think some better terms should be made at some point. But I'm not qualified for that. Can't speak of physics in general, since it's a pretty broad subject. But in the case of thermodynamics, there are many who consider the terms of chaos/disorder and order to be the wrong terms And in my opinion rightly so. But the names have been used so long, it's kind of a standardized thing now. But if we look at a more "normal" example than the heat death of the universe, it makes a bit more sense. If we convert a potential source of energy into heat, we will see molecules behave a lot more erratically. For instance if we have a heater on, high quality energy is turned into heat, and we see the air molecules shake and move a lot more. So in that sense they seem more disorderly. Today we cover entropy and the heat death of the universe. The previous chapters can be found here and here. While I recommend you read both, you should at least read the first part and skim the second. A collection of all topics covered can be found here: https://tildes.net/~tildes/8al/. Entropy describes how chaotic a system is. In thermodynamics, chaos is created from an irreversible process. We are all sort of familiar with this concept. A broken cup will not unshatter itself. As a consequence of how our universe works, (net) chaos can only increase. And this might have far reaching consequence, if we look at the effects of entropy on a cosmic scale. Entropy describes an amount of irreversible chaos. But first, let's cover cycles super quickly. In thermodynamics, a very important concept is a "cycle". A cycle is a repeating process, that returns to its initial condition. For instance, when we ride a bike. We're turning our feet around the crank shaft. Repeatedly returning to the same position we started from. As we push on the pedal, some of our work is lost and turned into heat. Primarily due to friction from the wheels and from the different mechanical parts. A cycle that wastes no energy is called a reversible cycle. That would mean 100% of the work in a cycle (even the work that is turned to heat) has to be returned in some way to its original state. The most famous example of this is the Carnot heat engine. But in reality, the Carnot heat engine is nothing more than a theoretical engine. As we remember from before, we cannot turn 100% of heat back into work. So any heat engine, be it a car's motor, a refrigerator, a star, or the human body, will in some way contribute to this irreversible chaos. Now what about entropy? If we look at entropy at the molecular level, it all becomes a bit abstract. But we can think of this concept with bigger building blocks than molecules, and still be close enough. Say you have a brick house with orderly layed bricks. This house would love to come crashing down. And lets imagine it does. When the house lays in ruins, it is not likely to suddenly "fall" into the shape of the house again. So if the house has collapsed, our system is in a higher state of chaos. Our entropy has increased. And unless we supply work to the system (and waste energy trough heat), we will not get the brick house back. So now we understand, that on the grand scale of the universe, entropy will only increase. But what are the consequences of this? Imagine entropy going on for billions and billions of years. Everything in the universe slowly reaching a higher state of chaos. Everything that is orderly, turns into chaos. All high quality energy has turned into low quality energy. Everything has been wasted and turned into heat. Everything ripped apart until you are left with nothing to rip apart. At this point, there is no interactions between molecules any more. Everything has reached absolute zero temperature. At this point, entropy is at its absolute maximum. And we have reached entropic equilibrium. This is the heat death of the universe. Of course, the heat death of the universe is just one of the many theories about the end of the universe. It assumes that thermodynamics properly describes the universe, and that there are no hidden surprises. Frankly told, it's the best bet we have with our current knowledge. But we still know so little. So I would not panic just yet. Alternatively, this is where we could continue with "an engineer's perspective on existensial nihilism". But I think that this is something better reserved for later, and better presented by someone else. We have covered what I consider the absolute minimum of thermodynamics, that still gives us a basic understanding of thermodynamics. There are of course a lot of other topics we could cover, but thats it for now. I will potentially write an appendix later with some questions or things that have been asked. But for now, that's it. Questions, feedback or otherwise? The Carnot heat cycle is a bit beyond the level of what we have discussed so far. It describes a system where heat is supplied and removed to have a piston expand and contract without any energy becoming waste heat. Guess I've misunderstood some things. Thanks for clarifying. I briefly touched on this during my own education. I never got an answer when I asked if light was a wave, particle or something else. So we still don't really know? Thank you very much. No worries, hearing people enjoy it is enough. Sometimes there just isn't that much to ask. Today we cover equilibriums and phase changes. Through that we will get a basic understanding of how things like pressure, temperature, density, volume, etc. are related. The previous chapter can be found here: https://tildes.net/~science/8ao/. I highly recommend that you read it before continuing. "Equilibrium" is fancy word for "balance". A system is in equilibrium when it is in balance with the surrounding systems. Any system will naturally attempt to be in equilibrim, and will adapt its physical properties to do so. 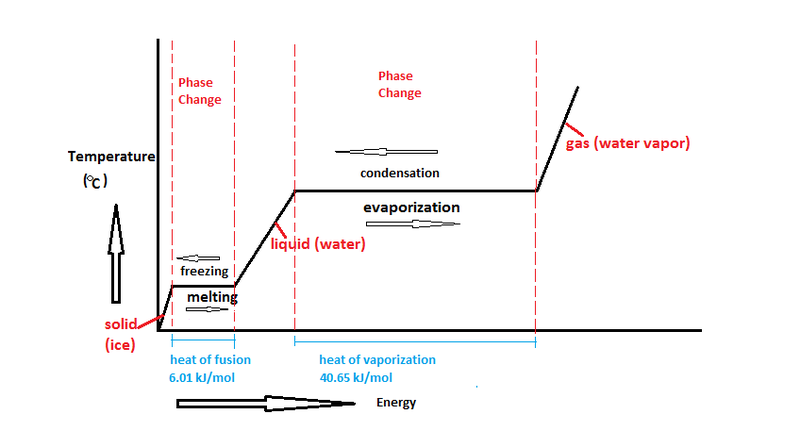 A phase change is the transition of matter from a state (solid, liquid, gas, or plasma) to a different state. This happens due to a change in internal energy, changing how a material is bonded. Now that we have it summarised, lets dig a bit deeper. A system always tries to be in balance with its surrounding systems. We maybe don't think about this a lot, but we are all very familiar with this principle since we observe it every day. If you have a cup of hot cocoa, it will cool down until it has reached ambient temperature. At this point, the cocoa is considered to be in "thermal equilibrium". If we fill a balloon with air, it will expand. It will do so until the air inside the balloon has the same pressure as the air outside the balloon. At this point, the balloon is considered to be in "barometric (pressure) equilibrium". Just like when we talk about energy, there is a relationship when we talk about equilibriums. We have something we call (you may remember this from basic chemistry) an "ideal gas". An ideal gas is a good way of looking at this principle. Since the temperature, volume and pressure have a direct relationship. Pressure-volume-temperature diagram for ideal gases. Any material has a set of phases. The ones we'll discuss are the solid, liquid and gaseous phases. Unless we control the material's environment very carefully, materials will always follow this order when energy is added. Solid becomes liquid, liquid becomes gas, and vice versa. For instance water; ice (solid) becomes water (liquid), water becomes steam (gas). So each of these transformations is a phase change. So when water is solid (ice), the molecules are in a grid. The molecules do not move around much, maybe a little bit where they stand. But they all still stand in a grid. When the water gets heated up, the molecules will start to move. Molecules have a natural attraction to each other due to subatomic forces like the van der Waals force. So the molecules will no longer stay in a grid, but they will still keep each other close due to this attraction. So a material that sticks together but freely moves around is called a liquid. Once the material overcomes this natural attraction, the molecules can go anywhere they want. And that's when we get a gas. Or steam, in the case of water. All of this applies even for materials we don't usually imagine would melt or evaporate, for instance steel. Here is a visual representation of the three states. Now comes the fun part. Ice is water that is at 0 degrees Celcius or below. Liquid water is water that is 0 degrees and above. But wait! Does that mean that water can be both solid and liquid at the same temperature? Yes, indeed. A material requires a certain amount of internal energy to become liquid. That is why internal energy and temperature is often used interchangeably, but is not exactly the same. The water molecules in ice will use the supplied energy to get excited and start moving around. This continues until the solid-liquid water reaches a point where all molecules move around. At that point it has completely become a liquid. While water is in solid-liquid state, the amount of internal energy dictates how much is liquid and how much is solid. The exact same thing happens with water at 100 degrees. It can be steam or liquid, but not fully either until it reaches a certain amount of internal energy. Here is a diagram of this process. Another fun tidbit that makes water special: Water has a lower density as a solid than it has as a liquid, when both are at 0 degrees Celcius. This means that per unit of volume ice weighs less than (liquid) water. Therefore ice floats on top of water. This is the only material that behaves in this way. And thats extremely important to our existince, since it helps regulate heat in the ocean. We have learned a few new things today. But there is one really important wrinkle to all of this. A system always will try to be in balance. And this we can exploit. Pressure is a type of "pushing". So thats a type of work! And an increase in thermal energy can lead to an increase in temperature. We remember that from the ideal gas. So if we cleverly organize our system, we can create work from heat! This is the basis behind most heat engines (simplified a ton). We supply thermal energy to some gas or fluid, and extract work from this gas or fluid. A classical example is the steam engine. We have water inside a closed system. When we heat up the water, it will turn into steam. And this steam will want to be much less dense than water. As a consequence, the pressure inside the water tank increases drastically. We release a small amount of this steam into a closed piston. Here is an animation of this in action. The piston suddenly gets a high pressure level. As we remember, it will want to be in equilibrium with its surroundings. Currently the pressure inside the piston is much higher than outside the piston. As we remember from the ideal gas law, a higher volume will mean a lower pressure. So the piston will be moved, as the steam expands to reach a pressure balance. The movement from the piston will drive something, like a wheel. The steam is removed from the expanded piston, and the piston will return to its closed position. Then the process is repeated again and again, to have the piston continously move something. All that from a bit of water in a tank and some supplied heat. Next time we will talk about another important property. Entropy! In the previous topic I had a lot of questions regarding the quality of energy types, and what specifies heat from work on an intrinsic level. Entropy is the big answer to this. From that we will also cover the heat death of the universe, which would be a good introduction to "a laypersons introduction to nihilism" if we have any philosophers here. For solid and fluid materials (as well as non-ideal gassess) this becomes a lot more complicated. If we ever do a "layperson's intro to fluid mechanics" we will cover it then. This described design is very inefficient and very simplified. Usually the piston is made so steam is supplied in turns supplied to either side of the piston. Then the work will both removed the steam that already performed work as well as move the piston. That way you can have continous movement in both directions. See for instance this image. No, you're sort of on to it. You can convert energy from one type to another. But you cannot convert 100% of a heat into work, whereas you could convert 100% of work into heat. The big factor that makes this a bit easier to think with, is a property we call "entropy". Which I will get into more detail at a later post. In your example, the only thing I think you had "wrong" is that you treated the balls as atoms/molecules. But the balls are an arrangement of rubber molecules, that have an inherent type of structure. A ball can experience an impact in the form of deformation, as opposed to the type of interactions we see in "heat". If we were to say that the room is rigid in all ways and the balls are one molecule big, you'd be right. I don't know information-theory, so I don't feel qualified to answer this. Hopefully someone else will come to the rescue. Do you have any recommendation on how to go about "defining" a system (non-physical)? For example in voter models or opinion dynamics, could we define something analogous to Energy/work/heat? Sorta. This is the kind of stuff researchers or physicists are much better at than me. Generally speaking, just like with Thermodynamics, it's more about defining things properly and setting up good models. I mostly work with reactive systems. But any pattern is a factor you can simplify or expect is good. If it behaves similarily as a natural system, you can start making rules. I remember that a way to think about black holes radii, Hawking radiation, etc. (and do back-of-the-envelope calculations) was to define a temperature/energy/entropy for the black hole system. It was pretty cool but it was also not related to normal definitions (for example energy was related to the surface area of the event horizon). So I wonder how do people go about defining these concepts and if it is possible to do so for every system or there are requisites for what a system must have in order to have thermodynamical properties. That is completely beyond me, sorry. I remember the pain of statics very well. Problem with it too is that engineering statics takes so many formulas and predefined rules from empirical data. If the source material isn't too concerned with figuring out why things are the way they are, it's very hard to make students understand why things are that way. Though I might be biased since my lecturer might have been the most incompetent man to walk the earth. Thermodynamics is a lot more elegant in that way. It's not perfect. But everything is related, and ideally you want to define as much as possible. So both seems to be about energy in the motions of a collection of molecules, only in one case the motions are random and in the other case the molecules collectively move together in one direction. If so, what would be the boundary for the "level of randomness" between heat and work? You actually hit one of the core definitions straight on the head. Heat is considered a "low quality" energy because it cannot be directed. It is not orderly, just is randomly moving. Work is a "high quality" energy. It can be ordered in a direction, so it is orderly. We can convert (about) 100% of high quality energy into low quality energy. For instance an electric heater will waste (near) nothing of its energy on movement or deformation. It all goes into heating a room. So we take a high quality energy and use it to create a low quality energy. But we cannot do it in reverse. It's not possible to take all low quality energy and turn 100% of it into high quality energy. If you burn a log, it's a lot harder to turn the heat into a log again. This is the basis of entropy (and so important its the second law of thermodynamics!). We can only increase the chaos in a closed system, not decrease it. Let's say I have a big room filled with a bunch of randomly bouncing normal-sized balls. I then transfer energy into the room by continuously hitting the wall with high velocity rocks from the outside, causing the wall to vibrate and bounce the balls inside more violently. If the balls movements are random, is it correct to say this collection of balls receives an increase in thermal energy? You would most likely lose that energy again since vibration is work. Think of it rather this way, you are supplying energy to a closed system. In this example, the balls are moving around more. So you supplied energy which is used to perform more work. If we assume that there is no air resistance or friction inside the room then no changes to heat should occur. The balls will just move faster, but thats it. But in reality the balls will collide with molecules in the air, and collide with the wall. So you will generate heat due to friction. And the temperature increases. EDIT: The types of energy and entropy we will actually touch in part 3. I didn't originally plan on adding enthalpy and gibbs energy since it's a bit more technical. I can write a bit about it, but I think that will be an addendum to part 3 (if all goes to plan). I'll try to remember to tag your name when that day comes. EDIT: In general I don't mind going a bit more technical if people want it. That goes for all the stuff posted. @wanda-seldon has been giving us an introduction to quantum physics. For now, she will be given a short break to prepare new stuff. In the meantime I will be covering some classical mechanics, more specifically thermodynamics. In part 1, we need to work our way through some of the more dry concepts, so we can understand and appreciate the horrifying implications of the fun parts. So I promise, this will be the most verbose one. Some of you may have briefly seen a version of this posted, that was due to me misunderstanding the schedule with @wanda-seldon. If you saw that one, I will mention I rewrote nearly all of it to be more readable. Now, on today's agenda: The basics of heat, work and energy and how it's all related. If @wanda-seldon in her posts mention "energy", it's most likely in the context of energy operators, which is a concept in quantum physics. I'm not going to pretend I understand them, so I will not be explaining the difference. We will cover what energy is in classical mechanics. So keep that in mind if you read something from either of us. What is heat? Using a lot of fancy words we can describe it as follows. Heat is an energy that is transferred between systems by thermal interaction. And what is work? Work is an energy that is applied in a way that performs... work. The combined energy in a system is called internal energy. This type of energy can be transformed or applied to other systems. These are a lot of new words, so lets break that down a bit. A system is just a catch-all term for something that can be defined with a boundary of sorts. Be it mass, volume, shape, container, position, etc. A canister, your tea mug, the steam inside a boiler, your body, a cloud, a room, earth, etc. They are all systems because you can in some way define what is within the boundary, and what is beyond the boundary. In theory, you could define every single nucleid in the universe as an unique system. But that would be counter-intuitive. In thermodynamics we tend to lump things into a system, and treat it as one thing. As opposed to Quantum stuff that looks at the smallest quantity. Calculating every single water molecule in my coffee would be pure insanity. So we just treat my mug as the boundary, and the tea inside the mug as the system. And just so it's mentioned, systems can contain systems, for instance a tea mug inside a room. Energy is some quantifiable property that comes in either the form of heat, work. It can be transferred to other systems, or change between the different energy types. An example of transfer is my coffee cooling down because it's in a cold room. That means heat has been transferred from one system (my mug) to another system (the room). Alternatively you could say my hot coffee mug is warming up the room, or that the room is cooling down my coffee. Thermodynamics is a LOT about perspective. An example of transforming energy types is when we rub our hands together. That way we convert work (rubbing) into heat. It's really not more complicated than that. An interaction in this case is just a system having an effect on a different system. So a thermal interaction means it's an interaction due to heat (like in the mug example). This brings us to an extremely important point. So important, it's considered "law". The first law of thermodynamics even. Energy cannot be destroyed, it can only change forms. Your battery charge is never really lost. Neither is the heat of your mug of coffee. It just changed form or went somewhere else. The combined energy of all types that is residing inside a system is called internal energy. Let's say we have a system, like a room. And all windows and doors are closed, so no energy can leave. In this system, you have a running table fan connected to a power line, getting energy from outside the system. The table fan is making you feel cool. Is the fan cooling down the room, heating up the room, or doing nothing? Think about it for a moment. The first thought of many would be to think that this fan would cool the room down, it sure makes you feel cooler! But it's actually heating up the room. As we remember, internal energy is the energy inside a system (room, in this case). The fan is getting energy from outside, and uses this energy to perform work. The fan accelerates the air inside the room, and this accelerated air will evaporate some of your sweat, so you feel cool. But as we remember, energy cannot be destroyed. So we are importing energy into the system, increasing the internal energy. Some of the work from the fan is also directly converted to heat, since the motor of the fan will get hot. So if we are not getting rid of any of this excess energy, we are increasing the internal energy. And therefore actively increasing the temperature of the room. To use a more tangible example: Simplified, this phenomena is why green house gases are bad. Lets define earth as a system. Earth gets a lot of energy from the sun. And a lot of this energy will be reflected and sent back to space. Green house gases will reflect back some of this energy trying to leave earth. So instead of having a roughly equal amount of energy enter the system (from the sun, from us doing stuff, etc) that leaves out in space, we have an increasing amount of energy on earth. This, as a consequence, increases temperature. Now, what are the maybe not so obvious implications of this? Waste heat, from supplied energy or inefficient work is a constant headache in engineering. If we cannot remove enough heat, we will actively heat up objects until they are destroyed. Thats why good cooling systems are important in cars, computers, etc. Now this was not so bad. In the future we will cover phase changes, equilibriums, entropy, the heat death of the universe and briefly touch upon engines. So thats most likely two more parts after this. After that @wanda-seldon will take over again. I plan on doing one main part per week, but if something is asked that warrants a small topic I might do smaller ones inbetween. Something unclear? Got questions? Got feedback? Or requests of topics to cover? Leave a comment.